The Fairway Villas at Green Valley Ranch is a 55+ community in Denver, Colorado. This active adult community has 220 homesites located between downtown Denver and the airport. All homes are Energy Star qualified and were designed to maximize spaces and values. All new buyers enjoy special golf club incentives, no separate homeowners' association fees and a direct path from the Green Valley Ranch Golf course clubhouse to the Fairway Villas clubhouse. Fairway Villas is Denver's closest active adult community to the regional international airport. Its location between downtown Denver and the airport offers the same traveling convenience to all other Denver areas. Nestled among wetland areas and ponds, the focal point of the community is the 18-hole Green Valley Ranch Golf Course. 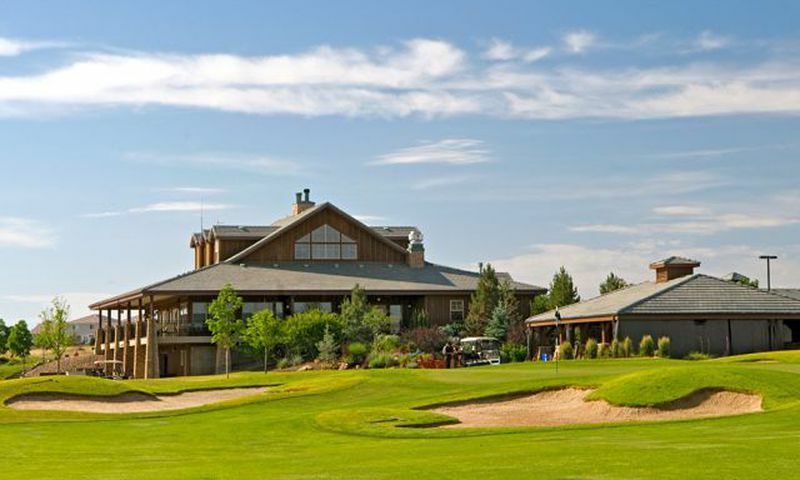 This par-72 course is home to the Colorado Open Golf Championships. Homeowners enjoy free exclusive rates, par 3 course, preferred tee times as well as pro shop and dining discounts. Services for residents also include food delivery from the Eagles' Nest restaurant. A 7,400 square-foot clubhouse, exclusive to residents of Fairway Villas, called The Club was completed in late 2013/early 2014. The clubhouse contains a fitness rooms, a lap pool/spa, hobby rooms, a library, and coffee bar. Residents will also have use of indoor and outdoor kitchens at the clubhouse, complete with dining terrace and fire pit. Outdoor amenities include walking/biking trails and an outdoor pool with uncovered pool deck and covered patio. The community will also contain manicured parks and natural spaces dotted with game courts. The single-family homes range in size from 2,090 to 2,764 square feet. Each floor plan features an included second floor "Smart Space" for a bonus living area, home office or storage. Homebuyers may optionally add an additional bedroom and bathroom to the second floor to make it the perfect private guest suite. All homes are third-party tested in order to calculate energy bills and are Energy Star qualified. Energy-efficient elements in the home designs include blown fiberglass insulation, 2x6 framing and CFL bulbs. Homes are appointed with gourmet kitchens and luxurious master bathrooms. The kitchens have islands, granite tile counter tops and black Whirlpool appliances with smooth top electric slide in range. All master baths have double sinks, large walk-in spa like showers and floor to ceiling tiles. New buyers are able to personalize their ranch homes to suit their personal lifestyles. As a whole, Fairway Villas at Green Valley Ranch Golf Club will provide an active country club lifestyle. A full-time activity director has potluck dinners, poker tournaments, salsa or Pilates-inspired exercise sessions and a book club scheduled on the community activity calendar. As residents begin moving into their completed homes, the director will encourage many other activities and clubs to grow along with the neighborhood. Situated along the Green Valley Ranch Golf Course, Fairway Villas in Denver is within close proximity to I-70, I-225 and Pena Boulevard. Along the I-70 corridor, residents will find a large community shopping center. Pena Boulevard and the interstates provide for a quick commute to medical facilities, recreation options, and major shopping areas like the Aurora Mall and the Shops at Northfield Stapleton. This suburban neighborhood also has a public library, an amphitheater, walking trails and a recreation center. Downtown Denver is about 15 miles away, easily accessible via I-70. The Fairway Villas clubhouse opened in late 2013/early 2014. The Club - 7,400 Sq. Ft. There are plenty of activities available in Fairway Villas at Green Valley Ranch. Here is a sample of some of the clubs, activities and classes offered here. The single-family homes range in size from 2,090 to 2,764 square feet. Each floor plan features an included second floor "Smart Space" for a bonus living area, home office or storage. Homebuyers may optionally add an additional bedroom and bathroom to the second floor to make it the perfect private guest suite. These homes will also feature a basement for even more space. I really like this community. They have a very intimate clubhouse that has everything you need. This is not a huge Sun City community but the location is perfect and the surrounding views are very attractive. Would highly recommend this community to consider. We built a new home here and are completely happy with it. The quality is outstanding and the features in our home are just as beautiful as the models. The models are really amazing and gave me some great ideas on how to finally decorate my home and be really happy to call it home. We love the amenities, the golf, the location, everything has been wonderful and we highly recommend Fairway Villas! The quality is can't be beat! 55places.com is not affiliated with the developer(s) or homeowners association of Fairway Villas at Green Valley Ranch. The information you submit is distributed to a 55places.com Partner Agent, who is a licensed real estate agent. The information regarding Fairway Villas at Green Valley Ranch has not been verified or approved by the developer or homeowners association. Please verify all information prior to purchasing. 55places.com is not responsible for any errors regarding the information displayed on this website.